If you're visiting Britain for the first time and wondering what local people mean when they direct you to "the High Street", you are not alone. The High Street is one of those phrases—and places—that is so much a part of everyday life in the UK that local people hardly ever feel the need to explain to visitors and tourists. 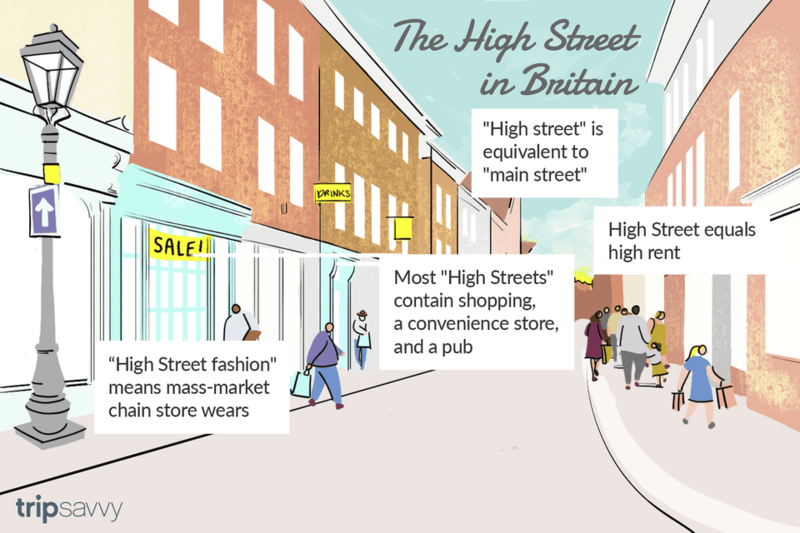 People in the UK use the term the high street the way Americans use the phrase Main Street. A high street is the main commercial and retail street in a town. In big cities, each neighborhood or district will probably have its own high street. In a small village, the high street may have little more than a mailbox, a public pay phone, and a small convenience store. At the very least, a high street usually has a pub. A town's high street is probably not in the highest spot in town. It may not be called "High Street". A street with that name may not be the high street. If a village is big enough to have some shopping (and many named places are not), the very least it will have is a newsagent/convenience store and probably a pub. In the smallest places, the newsagent serves as a post office, and sells some basic groceries and over the counter remedies. The shop may have an ATM for emergency cash and a bulletin board where local people buy and sell things and advertise for help. Move up to a somewhat bigger town and you'll find a chemists' shop/pharmacy, a convenience food store and, perhaps an ironmonger/hardware store. You might also find old-fashioned, service-oriented food shops—a greengrocer selling fruit and vegetables, an old-fashioned butcher shop and a bakery. Clothing shops, real estate agents, gift shops, banks, and coffee shops will all be lined up on the high street. High street rents are usually the highest for businesses in the town—so you are unlikely to find small, quirky shops for collectibles. You probably won't many fast food outlets either—unless they are part of big, national chains. It's just one of those quirks of language as occasionally used in the UK. People say the King's Road, the Fulham Road, the London Road, the M1 (a motorway). But they don't apply the word "the" to every place name. To a visitor, it can seem fairly random but you soon get used to it. High Street fashion describes mass-market retail style - the sort of clothing you will find in the chain stores. High Street fashion may be made to very high standards and of good quality materials, but its high volume manufacture and sale make it non-exclusive. The more cutting edge and directional a retailer is, the faster it will interpret designer fashions for the high street. Oddly, high street fashion can be found anywhere - in big department stores, in out-of-town malls, in chain stores, and in independent local shops. The phrase is applied to the top of the line goods and clothing, reinterpreted for more budget-minded shoppers - wherever you find them. In September 2016, the UK Department for Communities and Local Government announced the finalists in a High Street of the Year competition. Several on the shortlist were among our own favorites. In the City category, the Norwich Castle/Arcade District and Broadmead in Bristol made their way onto the list. The famous Pantiles in Tunbridge Wells, Kent was shortlisted in the "Local Parade" category and Falmouth was shortlisted among Coastal Communities.